When fully developed Tremella foliacea is even more contorted than its close relatives Tremella mesenterica and Tremella aurantiaca. In dry weather these fungi shrivel to hard blackish crusts, in which state they are much more difficult to spot. When it rains the fruitbodies rehydrate and turn translucent again. Late summer and autumn are the best times to look for Tremella foliacea, which is capable of sexual and asexual reproduction: it propagates not only via basidiospores but also by producing conidiospores. 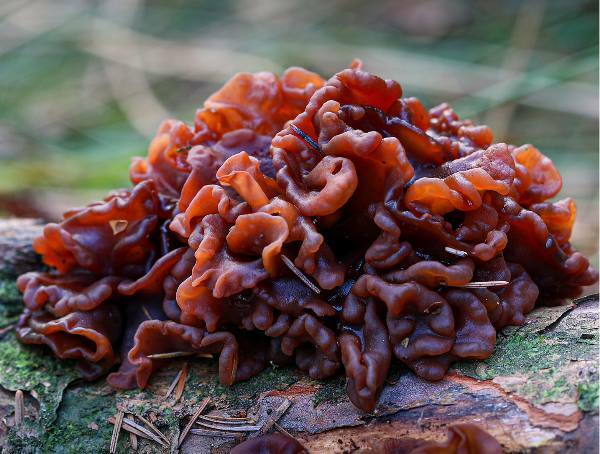 Like the closely-related Tremella aurantia, Leafy Brain, Tremella foliacea grows on dead wood that has been attacked by the wood-rotting fungus Stereum hirsutum, commonly referred to as Hairy Curtain Crust. Stereum hirsutum, shown above, is a conspicuous and very common species whose fruitbodies can be found throughout the year; this is the fungal host upon which the jelly fungus Tremella foliacea feeds. Leafy Brain fungus is fairly common throughout Britain and Ireland and is found also in other European countries from Norway right down to Portugal. This species is also recorded in most other temperate regions including North Africa, Asia, Australia and both North America and South America. It is truly a worldwide fungus. 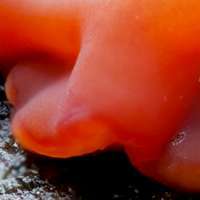 This jelly fungus was originally described in 1800 by Christiaan Hendrik Persoon, who called it Tremella foliacea, by which name mycologists still refer to it today. Tremella foliacea has many synonyms including Tremella frondosa, Tremella fimbriata Pers., Gyraria foliacea (Pers.) Gray, Tremella succinea Pers., Tremella nigrescens Fr., Ulocolla foliacea (Pers.) Bref., Exidia foliacea (Pers.) P. Karst., Phaeotremella pseudofoliacea Rea, and Tremella foliacea var. succinea (Pers.) Neuhof. Here you can see three stages in a food chain: Leafy Brain fungus Tremella foliacea feeding on Hairy Curtain Crust Stereum hirsutum, which in turn has been taking nutrients from a fallen birch trunk. Tremella, the generic name means trembling - a reference to the wobbly-jelly-like structure of fungi within this grouping, The specific epithet foliacea means folded or wrinkled like leaves. Initially disc-like, the fruitbody soon develops irregular convoluted folds with rounded margins. Individual fruitbodies grow to between 2 and 20cm across. 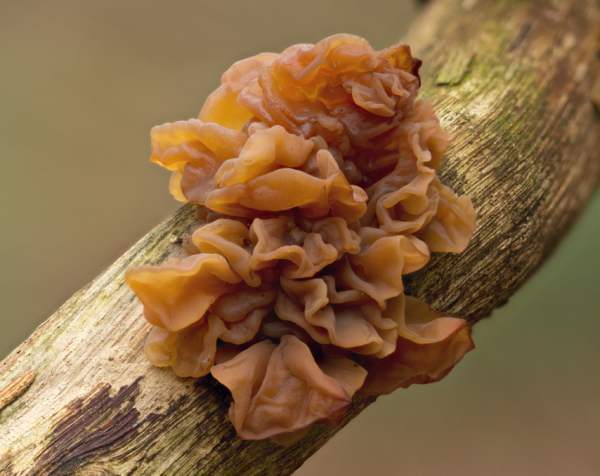 The leaf-like clusters of folded lobes are usually reddish-brown or pale pinkish-brown but sometimes reddish orange; gelatinous when damp, turning dark and shriveling to an inconspicuous fraction of its former size during very dry weather. 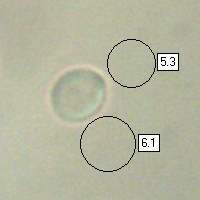 Longitudinally septate; 2-spored and 4-spored, with long sterigmata. Subglobose to broadly ellipsoidal, smooth, thin-walled, 6.5-10 x 4.5-8µm, inamyloid. 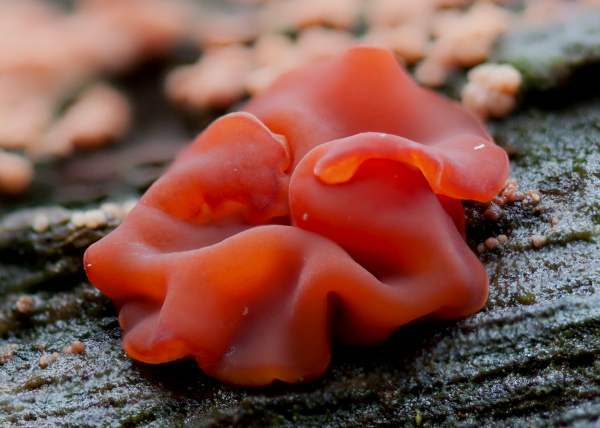 This jelly fungus grows on dead timber of broadleaf trees and conifers. 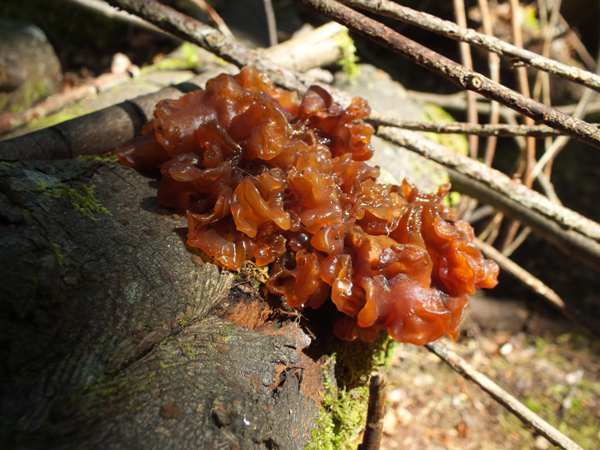 It is not the dead timber that Tremella foliacea consumes but rather a kind of bracket or crust fungus that itself has been feeding on the wood. Tremella foliacea must therefore be - Classed as a parasitic rather than saprobic species. 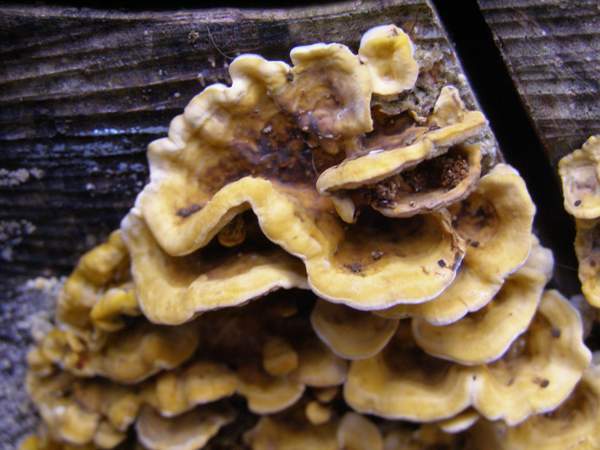 In Britain (and probably elsewhere) it attacks Hairy Curtain Crust Stereum hirsutum. 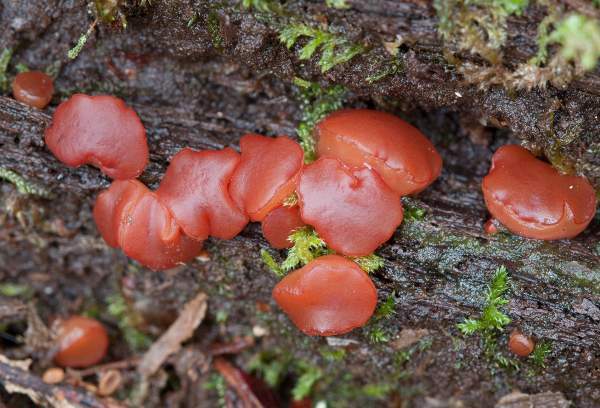 This jelly-like fungus can be found throughout the year, but it is most visible in autumn and winter. Tremella aurantia is also parasitic on Stereum hirsutum; its fruitbodies are yellow-orange and usually less tightly folded than those of Tremella foliacea. Tremella mesenterica is parasitic on Peniophora crust fungi, which occur on dead hardwoods, particularly oaks. 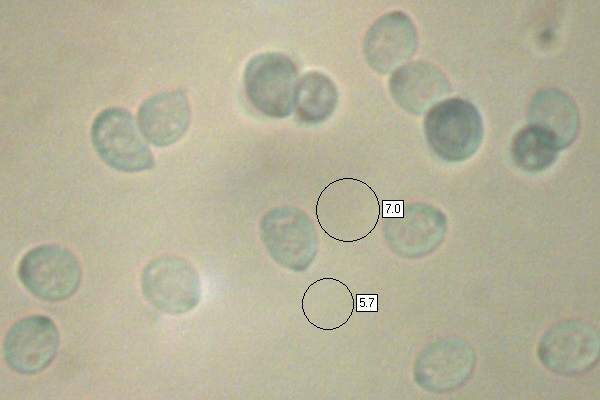 Its spores are broadly ellipsoidal. Some authorities say that this is an edible but very poor fungus, but being insubstantial it has no culinary value. Above: young fruitbodies of Tremella foliacea are disc-like but they will become contorted and develop multiple folds as they expand and approach maturity. Some pictures of Tremella foliacea fruitbodies shown on this page are shown courtesy of David Kelly and of Andreas Kunze/Wikipedia.